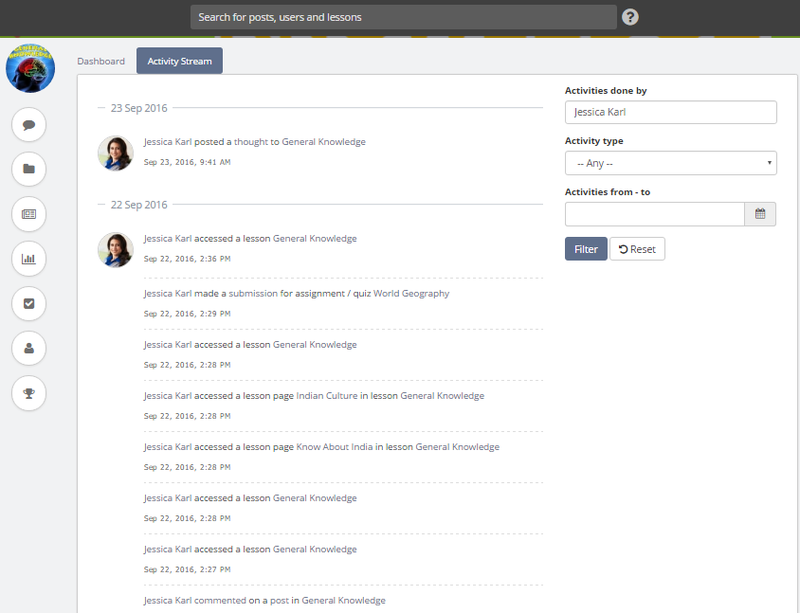 As an instructor, now you can track all the activity done by your classroom members from the Activity Stream page. 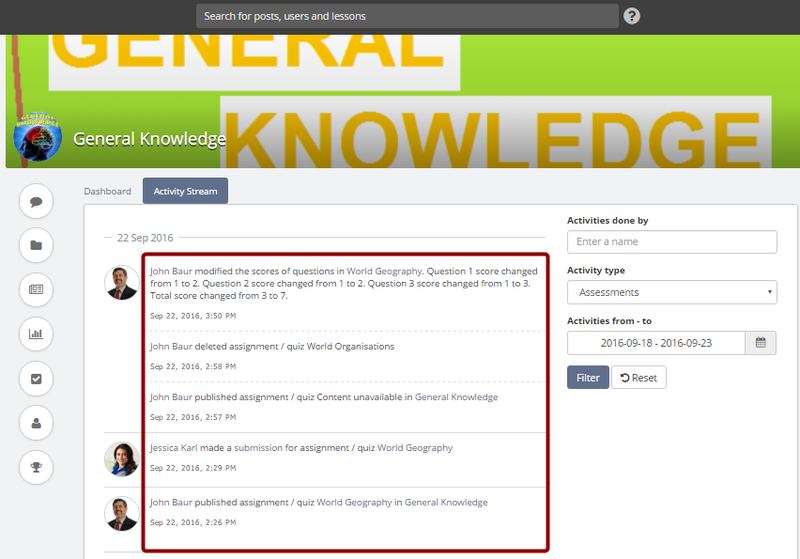 Basically, the Activity Stream is a place from where you can know which resources (Posts, Lessons and Assessments) have been accessed, completed, when and by whom. 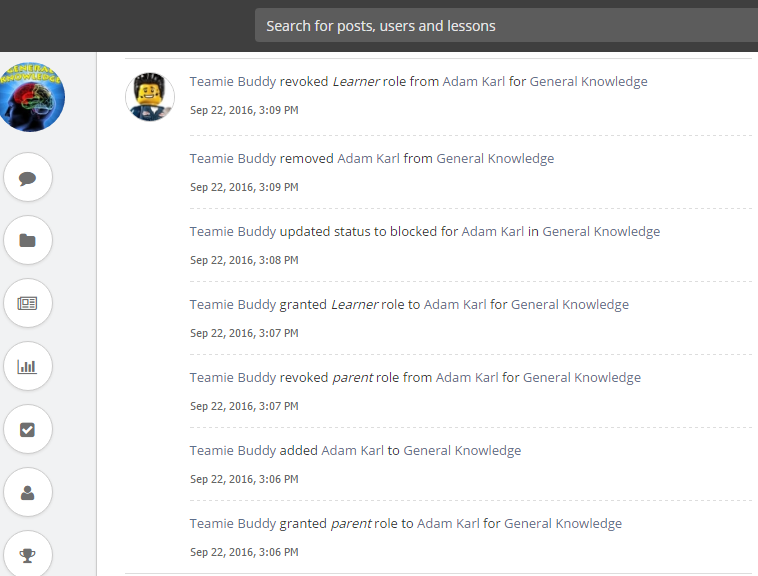 So when you get to Activity Stream page, you can sort through the list to see any user's activity report. Additionally, you may choose to see cumulative stats of all activity done by the classroom members on a particular resources. For e.g. 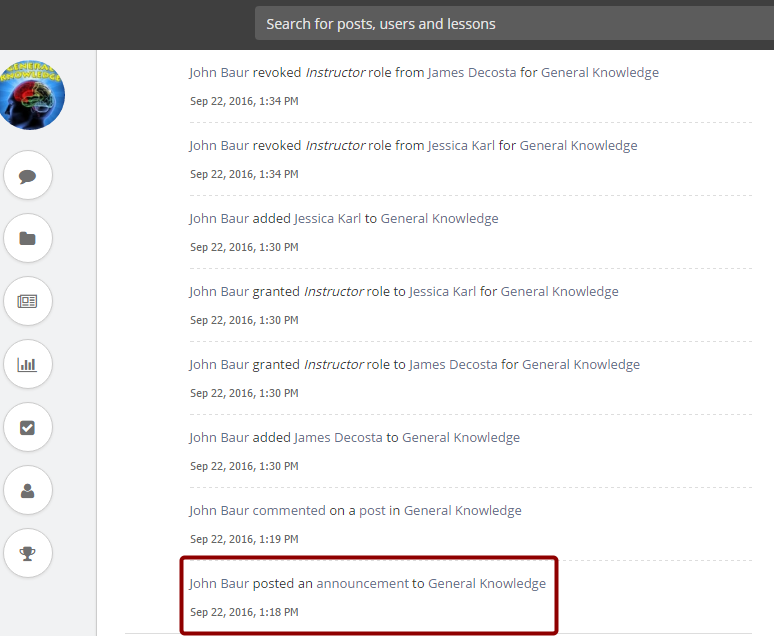 as an instructor, you can find out how many users have finished reading a lessons or how many users have made submissions to an assessment and lots more. In this article, we will focus on some important activities that we think, as an instructor, you must know. 1. 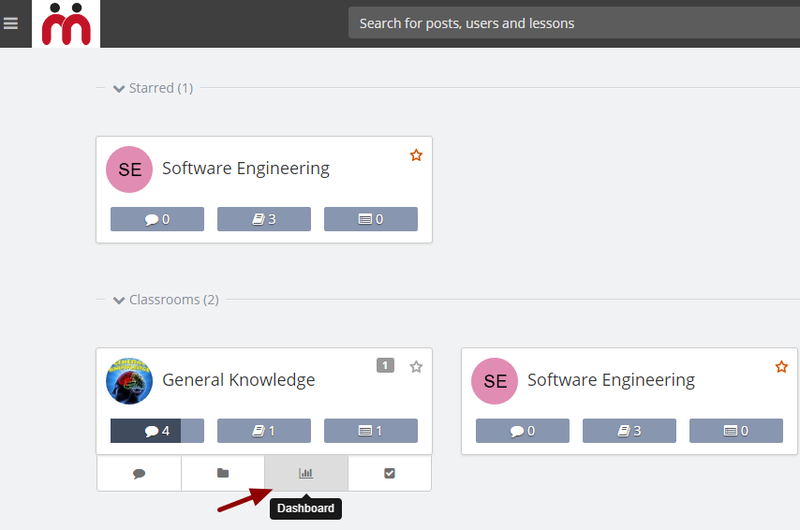 Click Dashboard of the required classroom. 2. 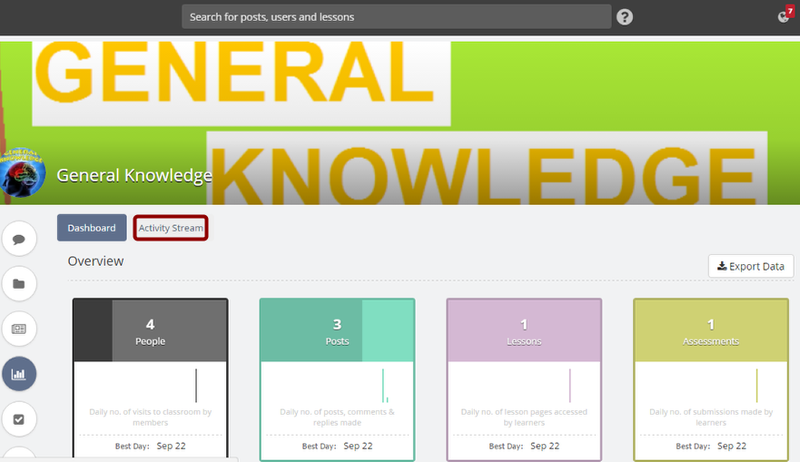 You can also access Dashboard of a classroom from its landing page. 4. The Activity Stream report shows which activities are done by enrolled users at the classroom level. Use the Activity filtering options at the top right corner of the activity stream page to look at particular user activities or apply activity type filters along with date ranges. 5. 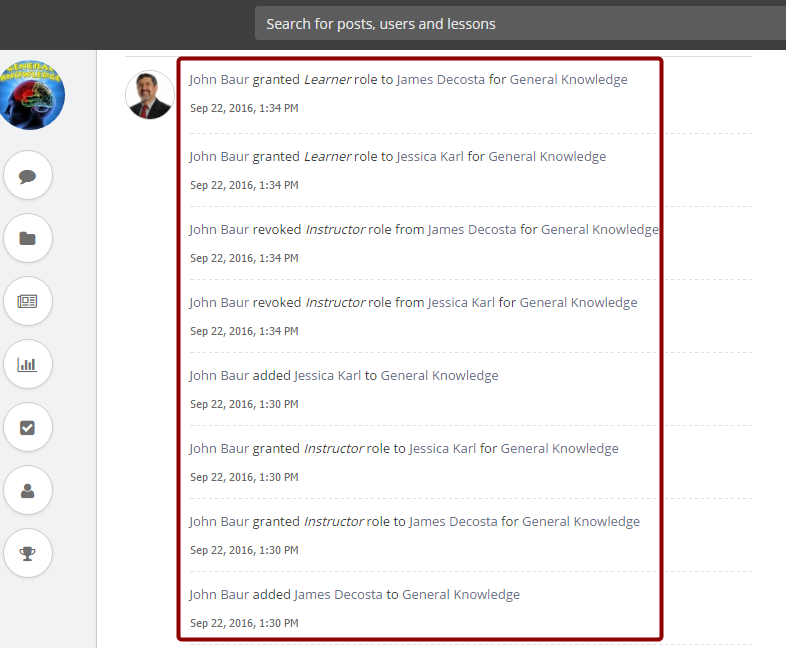 As soon as an instructor lands on the Activity Stream page, the first activity you will notice is that they have been granted the instructor role by the site administrator. 6. After an instructor is added to a classroom, they can start adding users and resources (Posts, Lessons and Assessments) in their classroom. 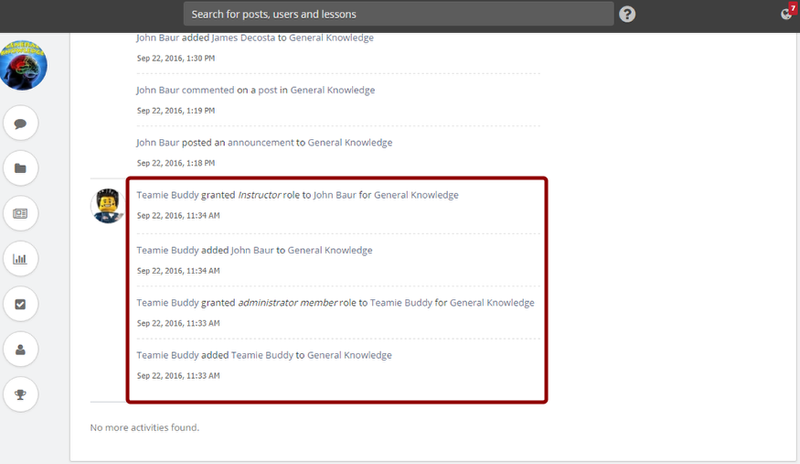 For instance, in the following screenshot, instructor had shared a post as an announcement. 8. 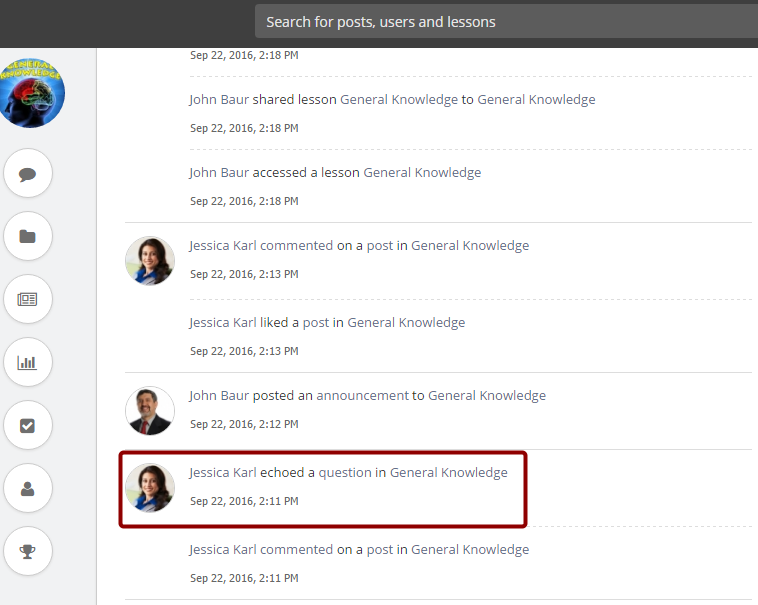 Whenever a user makes a comment or replies on your comment, such activities will be tracked in activity stream of the corresponding classroom. 9. 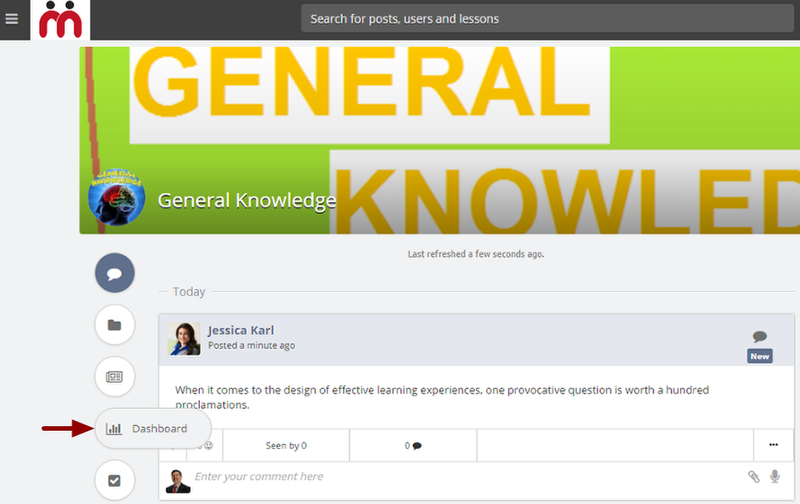 If any member of your classroom echoes your question post, an entry will be logged in the activity stream. Echoing a question represents that other user, who echoed your question post, had the same question. 10. 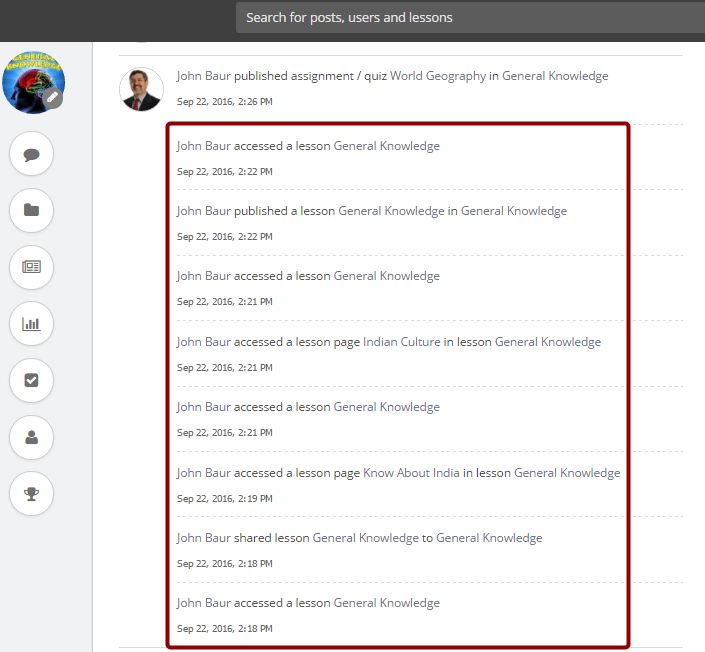 As an instructor, when you publish a lesson in a classroom, an entry is made in the activity stream. 11. 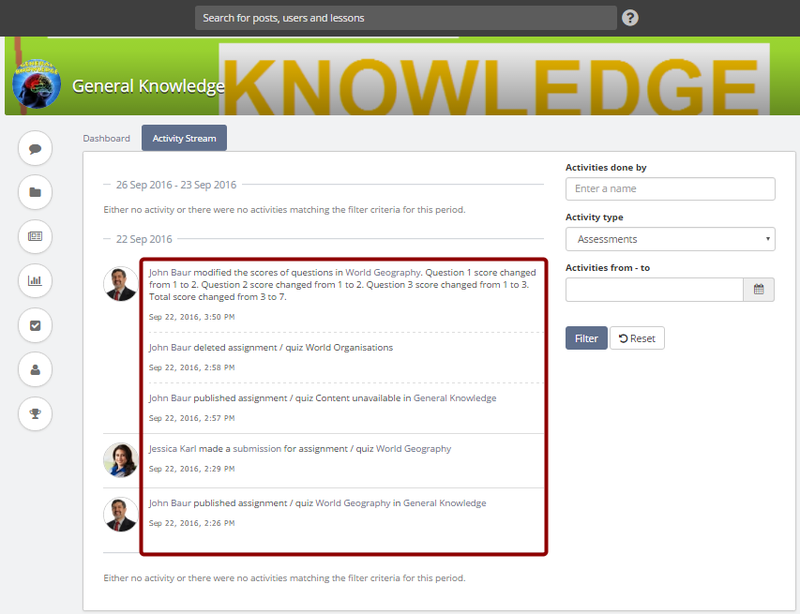 Similarly an entry is made whenever you publish an assessment (Online quiz, Assignment and Offline Tests are referred as assessments in Teamie). 12. As soon as a learner accesses a lesson, an entry is made. 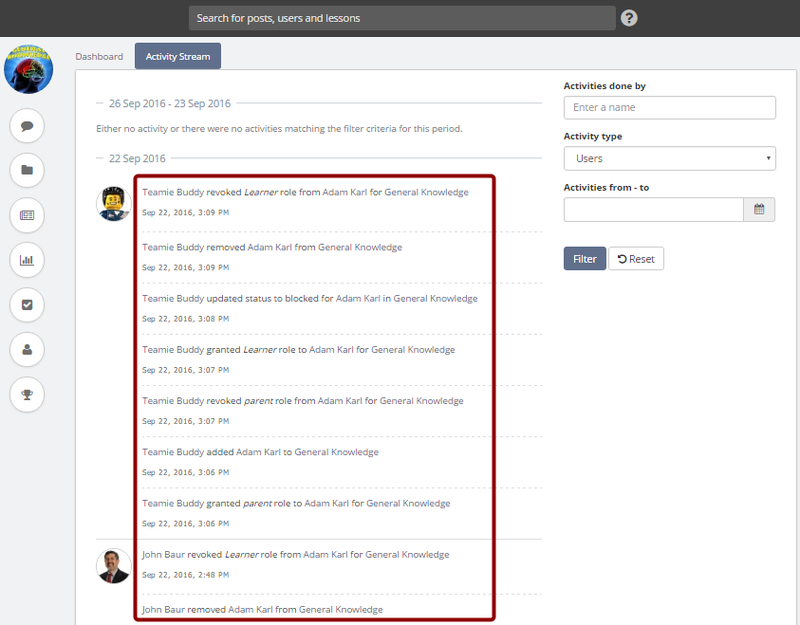 As an instructor you may see multiple entries for the same task. 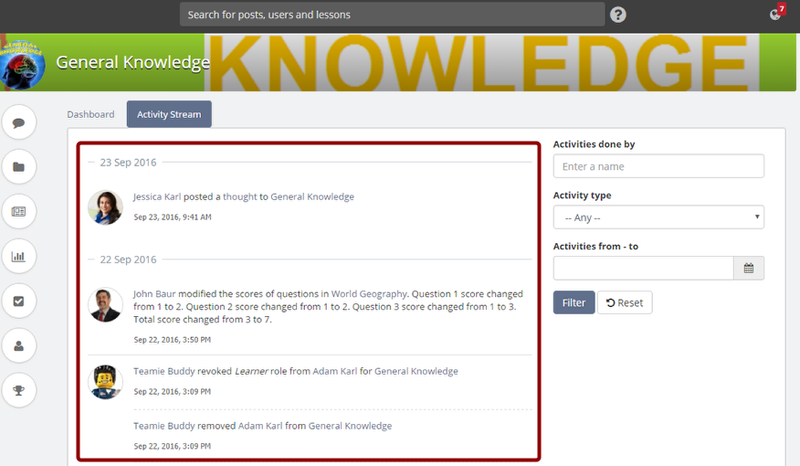 This indicates that a learner has accessed that lesson multiple times. 13. As an instructor, you can add users to your classroom, revoke and update their role, block their access to the classroom or remove them permanently from your classroom. 14. 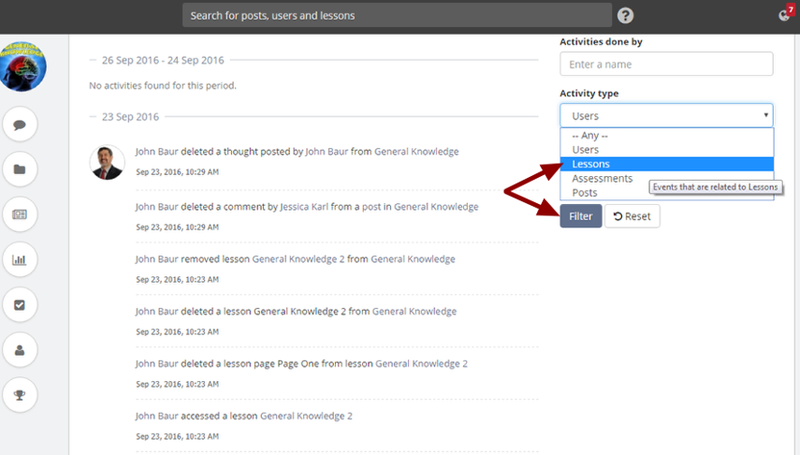 Any assessments which gets deleted from the classroom will have an entry in activity stream with a timestamp when it was deleted. 16. 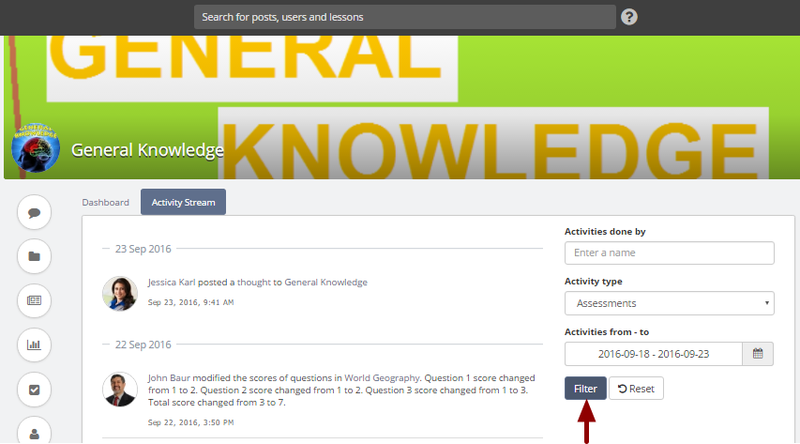 As an instructor, whenever you modify the score of your assessment's questions (applicable for quiz and assignments only), a log for this activity will be created in the activity stream and scores for all the learners, who have made the submissions, will be recalculated automatically. 17. 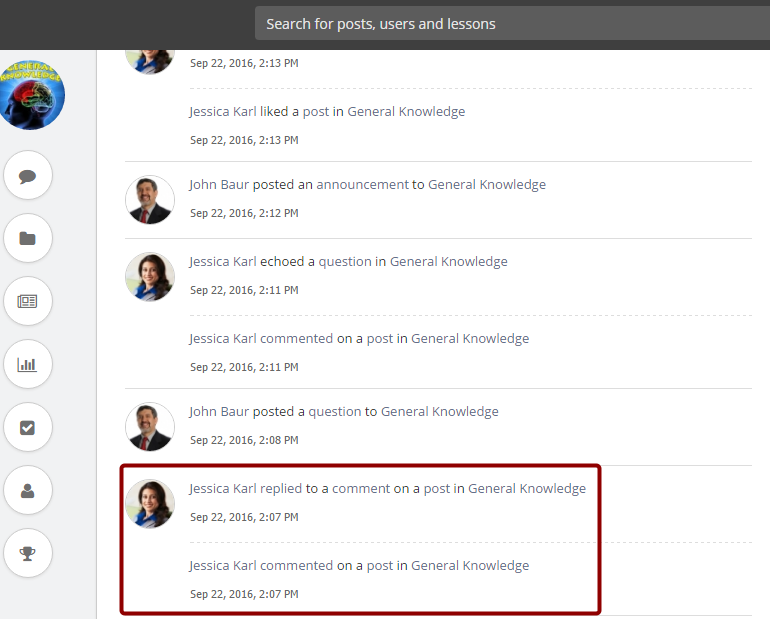 Your Classroom members can share posts in your classroom anytime. 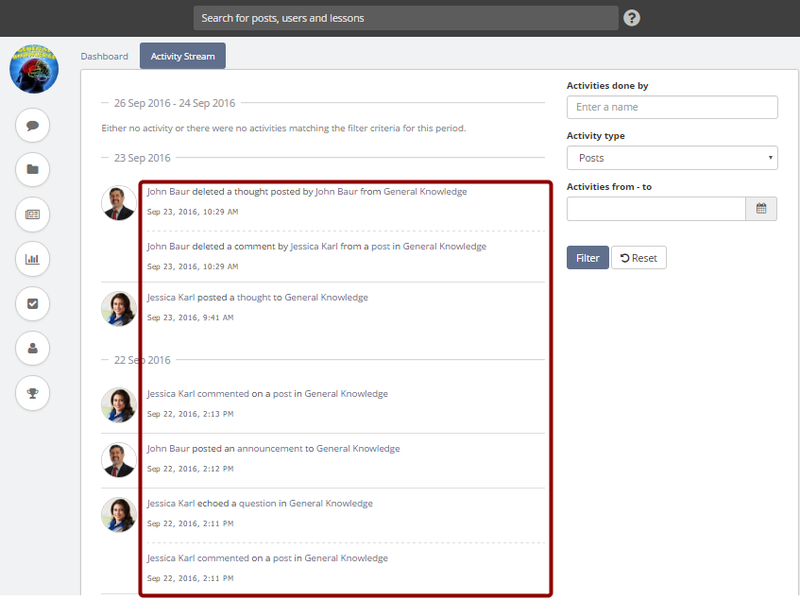 Whenever a new post is shared by them, an entry is made in the activity stream and you can track the particular user activities by applying available filters on the activity stream page as shown in the next step. 18. 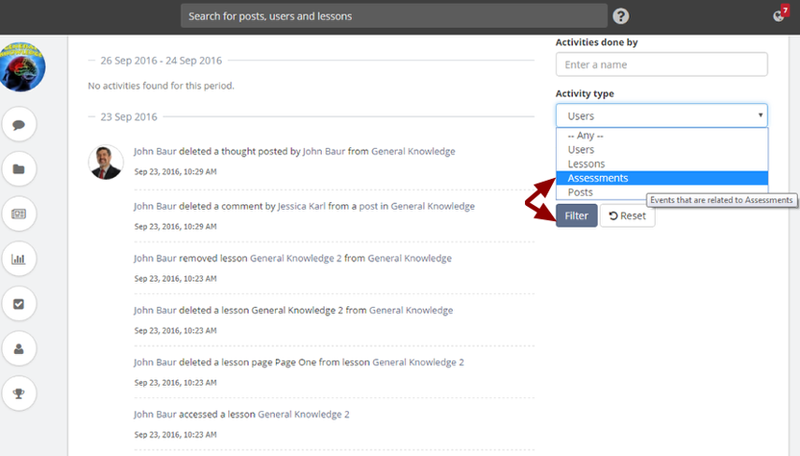 To check the activity log of a particular user in your classroom, type in the user name in the Activities done by text box and select the highlighted user name from the auto suggestion list and click Filter. 19. You will see a list of activities done by that particular user in your classroom so far, along with the time of the activities. 21. 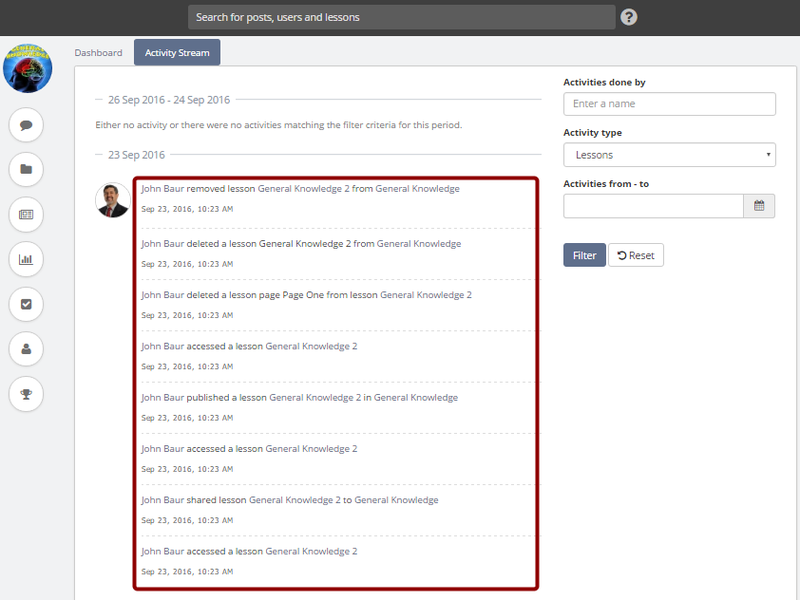 After the filter is applied, you will see a log of activities for the users account. 22. 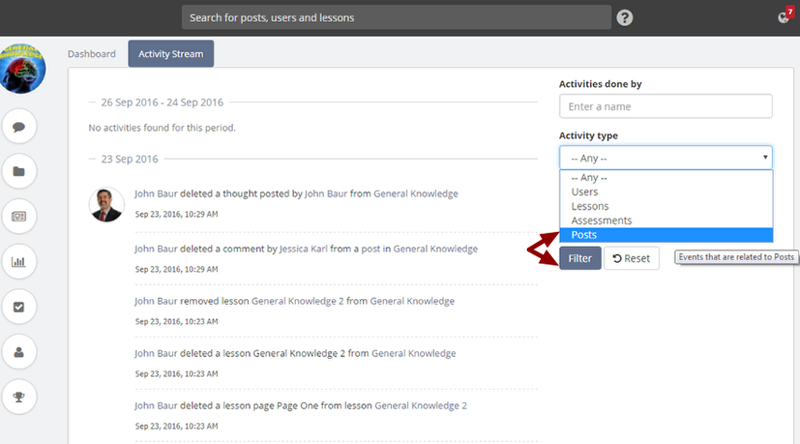 Select Lessons from the Activity type drop-down list to see the list of events that are related to the classroom lessons and click Filter. 24. Select Assessments from the Activity type drop-down list to see the list of events that are related to the classroom assessments and click Filter. 25. 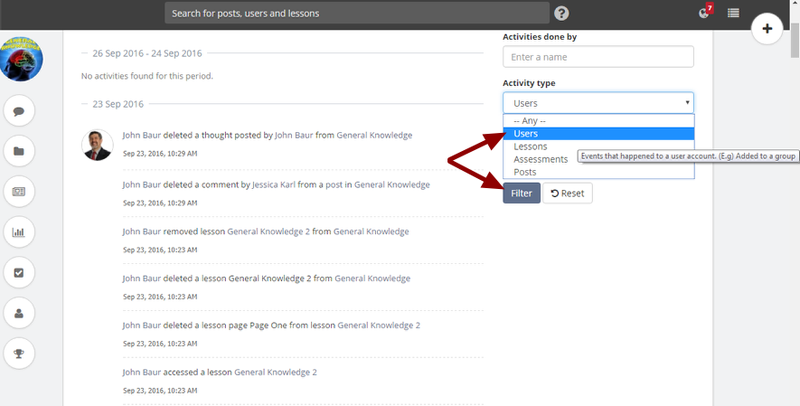 After the filter is applied, you will see a list of activities / events that are related to assessments. 26. Select Posts from the Activity type drop-down list to see the activities related to posts and click Filter. 27. You will see a list of activities / events which have been done by the classroom members on posts. 28. You can also apply Activity type filter with date range combinations. For eg: you may wish to know what are the activities that have been performed on assessments by the classroom members in the current week. To do this, select Assessments filter from the Activity type drop-down list and then select This week from the Activities from - to date picker field. Similarly, you can choose another date filter quickly like Last week, This month, Last month and Custom Range. Click Custom Range in order to select a specific period date range from the date picker. 30. You will see a list of activities which have been performed on various assessments in that current week. Similarly, you can view activities for other Activity type.